Guernsey's Marine Ambulance could be out of service for several more months following an accident last year. 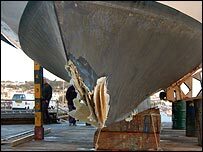 Repair work on the Flying Christine is under way after the vessel struck rocks off Sark in October. The Chief Ambulance Officer, Neil Tucker, says it is still too early to give a precise date for the completion of repairs. Mr Tucker says the delay is a frustration and they want the boat back in service as soon as possible.